The Super Sabre database project is dedicated to preserving the historical record of the North American Aviation F-100 Super Sabre, the first of the Century Series aircraft. When the database project has been completed, its database will contain the records for all of the 2,294 Super Sabres that were manufactured by North American Aviation. The database will contain the personal stories of the people who flew and maintained this magnificent aircraft. In addition, the database will include thousands of photos, audio, and short video segments to illustrate the story of the F-100. To get this really big project done, I need your help. If you were an F-100 pilot, a mechanic, a crewchief, or an operations officer, you have interesting stories to tell and you probably have photos to share. 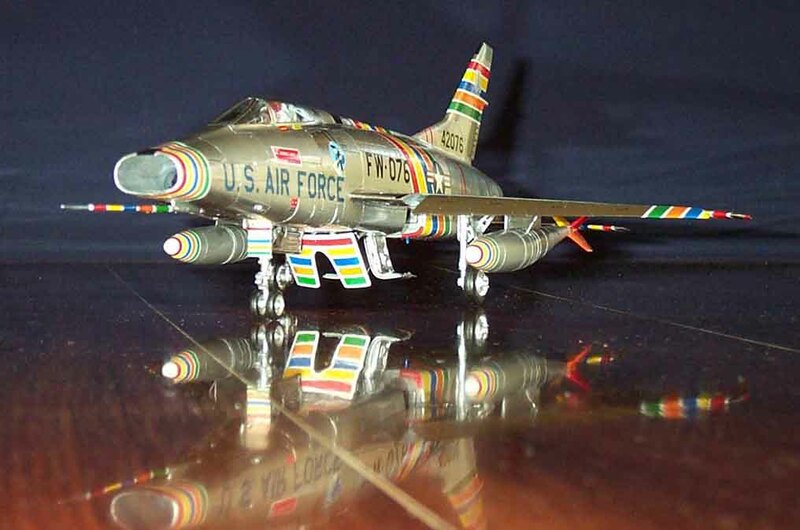 Or perhaps you were just interested in the F-100 and you happened to be in the right place at the right time to take photos or to collect photos or other memorabilia from a variety of sources. You may even be able to share some segments of old home movies that show the F-100. While you are looking at this website, please try the other links shown in the frame on the left side of the screen. (You can also select the links from the navigation bar at the bottom of your screen.) Thanks for spending some time with this website. And if you can help, please contact me.